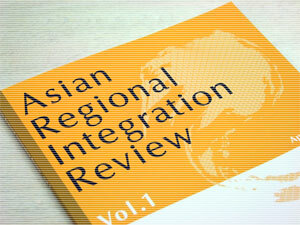 The Asian Regional Integration Review (ARIR) Vol. 1 is a collection of selected papers presented by participants of GIARI's Summer Institute. The purpose of the ARIR is mainly two-fold, to provide an opportunity for graduate students in PhD programs around the world who are interested in Asian regional integration to publish their research and to disseminate the research output of GIARI's Summer Institute. The ARIR is to be published once a year. To ensure its high quality, papers recommended for inclusion are subject to a rigorous refereeing process by the editorial board. The editorial board members sincerely hope that the ARIR will contribute to the nurturing of capable graduate students interested in policy-oriented research with a view toward Asian regional integration.